Leonid Ksanfomaliti, an astronomer at Space Research Institute of the Russian Academy of Sciences, claims to have detected signs of life in 30-year-old photographs of Venus. Of course, that's completely ludicrous... isn't it? Science fiction writers of the Golden Age often imagine that a habitable world existed hidden below the deep cloud cover of the Venusian atmosphere, and it made for some great stories - the time I read Ray Bradbury's "All Summer in a Day" in middle school still haunts me. But by the 1960s, the American Mariner probes and their Soviet Venera counterparts had revealed Venus was just about the most inhospitable place imaginable, an acidic world with surface temperatures of about 900 degrees Fahrenheit and pressures nearly 92 times that of Earth. "What if we forget about the current theories about the non-existence of life on Venus? Let's boldly suggest that the objects' morphological features would allow us to say that they are living." It's hard to say anything for certain without looking at the actual evidence - his article doesn't seem to be online yet - but obviously these claims seem extremely dubious, and this sounds like it's probably just a trick of the light, assuming there's anything there to begin with. So yeah, just to be clear, this is almost certainly nothing. If you want to play extremophile devil's advocate here, it's worth noting that we've discovered microbes here on Earth that can survive at pressures up to a thousand times that of Earth's surface, which is far worse than what's found on Venus. You could probably find extremophiles here on Earth that could handle the acidity and radiation of Venus, but the 900 degree temperatures are the big deal-breaker here - a 2003 study suggests that the upper temperature limit for any form of life is probably about 300 degrees, as DNA starts to break apart and lose coherence at that point. So, basically, even a tiny, microbial extremophile is almost certainly impossible on the Venusian surface, let alone a scorpion or disc or black flap. That said, the notion of life on Venus isn't a completely ridiculous - at least, not the idea of life above Venus. While there's no evidence to support the existence of life in Venus's upper atmosphere, its chemical composition has a lot of gases that don't readily form naturally, and it's possible that there are microbes up there that help produce them. 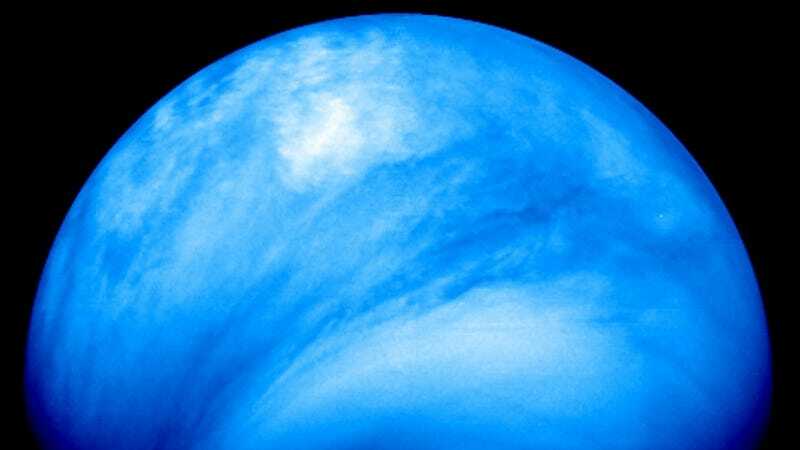 The upper clouds of Venus actually have highly Earth-like conditions, so extremophiles wouldn't even be required for life to survive up there. As far as these cloud-based microbes go, the current scientific consensus is that the possibility can't be dismissed. Of course, that's a far cry from actually proving there's life on Venus, and even that is still about a million light-years away from scorpions and black flaps hanging out on the Venusian surface. Via Yahoo! News. Check out The Planetary Society for additional debunkery. Image via NASA.